In Dark Angel, Gillian is the quiet girl no one ever really notices. She's lonely, and is suffering from her parents' crumbling relationship. It's while walking home from school one winter day that she falls into an icy river, and dies. On her way to heaven, she meets Angel, her handsome guardian angel, who insists that it's not her time yet, and makes her return to earth. But instead of going to back to her meek and quiet life, Gillian is transformed into the most popular girl in school—with Angel's help. But when Angel begins to manipulate Gillian into doing things she doesn't want to do, she must question everything she thought she knew about him and herself. Rashel is strong, mentally and physically, and hardened against life's injustices, a result of witnessing her mother's murder at the hands of a vampire. Now she has devoted her life to tracking down her mother's killer, becoming the most feared vampire hunter among the Night Worlders. But when a chance encounter with the vampire Quinn, who has a reputation to match Rashel's, leaves the both of them confused—and very much alive—they discover a bond between the both of them that could be their undoing in The Chosen. In Soulmate, Hannah's life is perfect: she has a great mother, a scholarship to her college of choice, and wonderful friends…except for one thing: she is going insane. Puzzling dreams and notes she's written but has no recollection of leave her miserable and frightened. But during her therapy sessions with a small town shrink, the shocking truth comes out. Hannah has been reincarnated since the dawn of Night World, following her soulmate Thierry, Lord of the Night World and immortal vampire. But as memories of past lives resurface, Hannah finds she doesn't entirely trust Thierry, and Maya, the original vampire, would very much like to rip Hannah to shreds. Like the first volume of the Night World books, Night World Vol. 2 is a supernatural lover's dream book. Smith's stories, though they revolve around the same beings, are all very inventive and unique. Her characters are varied and all have colorful personalities, which gives the concept of the Night World such authenticity. Smith’s writing also has an air of sophistication and ease that is very simple and enjoyable to read, but at the same time, deals with many complex issues. Like with the first volume, there is plenty of doomed romance and danger, but rather than coming across as cheesy, it is adventurous and polished. Also in this volume, readers get a feel for the changes that are going on in the Night World, set in motion by the original characters from Secret Vampire (Volume 1), Poppy and James, and Smith also adds some Night World history and lore in Soulmate. 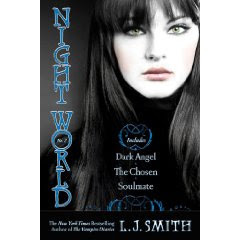 These little qualities that lend credibility to a comprehensive picture of the Night World are what distinguishes Smith's paranormal realm from the many others floating around in the genre, and make for a truly enjoyable reading experience. L.J. Smith is a master at mysterious, action-filled, romantic, and suspenseful reads. On a side note, the Night World books are perfect Christmas gifts! Three novels in one book for less than ten dollars! How cool is that? These do sound kind of cool! And definitely a great idea for a christmas gift! I haven't read any of these, but I really want to. I read The Vampire Diaries by Smith last year and loved them, so these are also on the top of my Christmas list!